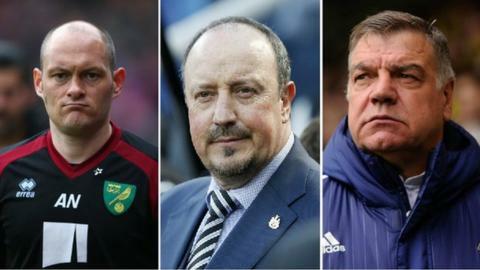 Which of these bosses will keep their side in the Premier League? After Newcastle's win over Swansea followed Sunderland's victory at Norwich on Saturday, it is tighter than ever in the Premier League relegation battle. Sunderland are one point behind Norwich in 17th with a game in hand and Black Cats manager Sam Allardyce says his side "cannot afford to fail any more" with five matches to play. Newcastle are two points further back after responding to boss Rafael Benitez's demands for "passion on the pitch" with a 3-0 victory. Both are chasing a Canaries side who can no longer be concerned about the style and must focus purely on results, according to manager Alex Neil. After another tense tussle at the Premier League's trapdoor, this is how the men in charge saw their side's predicament. Allardyce said his side's fine performance calmed fears he had over his side's ability to bear up under the scrutiny of a Premier League relegation run-in. "The position we've left ourselves in was making me feel a bit edgy this morning," he said. "Will we handle the pressure? Will we cope with the pressure? They've answered my questions. "They've coped with the pressure and coped with everything Norwich could throw at them. To come here and win 3-0 is a massive result." Sunderland will overtake Norwich if they avoid defeat at home to Arsenal next Sunday and Allardyce is relishing their improved position in the table. "If we'd lost we'd have been seven points behind Norwich," he added. "Now it's only one point, a better goal difference and a game in hand. If we can pick up some points next week, then we can rush in and see how everyone else has done." The Black Cats' victory was watched by a travelling contingent who had boarded buses on Wearside at 04:30 BST to get to Carrow Road in time for the 12:45 BST kick-off. Sunderland must negotiate a run-in that includes matches against Chelsea and Stoke, as well as Arsenal, to ensure a 10th successive season of top-flight football at the Stadium of Light. Norwich had distributed paper 'clappers' and 3,000 inflatable canaries to their fans in the hope that a positive atmosphere might prove decisive, but Neil warned they may have to "win ugly" to avoid an immediate return to the Championship. "If we're going to stay up we're going to have to do it the hard way. It's about winning games, performance is secondary," he said. "We've got four games remaining and we need to win at least two." Norwich's next match is in a fortnight against Arsenal and - with Newcastle and Sunderland both playing before them - the Canaries could find themselves in the bottom three by then. However, midfielder Gary O'Neil says the pressure of the relegation battle can play on Norwich's rivals as well. "Today was a terrible result for us. We had the chance to put destiny in our own hands and take a big step towards safety," he said. "We are still in front though, they still have to win points and their games are not easy. "Those two teams are down there because they have not been winning games, same as us. It is going right to the wire." The Magpies are a win away from joining Norwich on 31 points, and victory over Manchester City on Tuesday could even see them move out of the bottom three. According to Newcastle manager Benitez, the belief has returned. "Everybody was happy and I think they are now thinking that we can do it and they believe," said the Spaniard, who picked up his first win since taking over as manager on 11 March. "They have this feeling, like all the fans watching the team working as hard as today, everybody thinks we can do it. "That's the main thing. As I have said a lot of times, we will fight until the end, but now we are closer and it will be easier for me to give this speech." Andros Townsend - who scored his third goal of the season in the win over Swansea - believes the St James' Park support could prove key to keeping his side up. "It's massively important to build on this - it's a make-or-break week. Now on Tuesday [against Manchester City] the fans will be on our side and hopefully it'll be a great night. "Having four out of the last six games at home is massive." Defender Jamaal Lascelles, who scored the opener, said last week his team-mates needed to show "character, desire and heart" after the 3-1 defeat by Southampton. The former Nottingham Forest player said the loss gave the side "a kick up the backside". "Everyone knows we've got the talent, but today we showed how good we are and we stuck to the gameplan. "I thought I might get stick in the changing room after I had a go at my team-mates. I was going to say it sooner or later. The frustrating thing is we should have been playing like that earlier in the season."